Recent vegan and vegetarian converts often ask, "Is a peanut a legume?" Don't let the name fool you; the answer is not found in the food's moniker. 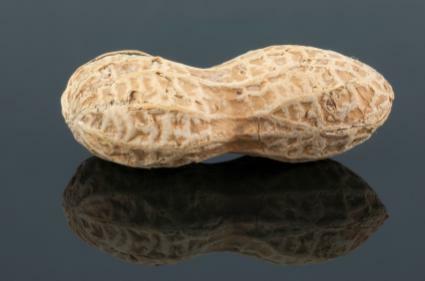 "Nut" may be in its name, but the peanut is in fact a legume. The popular protein source grows underground, not on trees like traditional nuts, such as almonds and walnuts. Legumes, also known as dried beans, are edible seeds which grow together in enclosed pods. Peanuts take about four to five months to mature from seeds into full-grown plants. Similar to fellow legumes beans and peas, peanuts are packed with nutritional benefits and are extremely versatile. Vegetarians and vegans are huge fans of peanuts. The legumes are packed with nutrients and are one of the healthiest protein sources around. However, vegans need to be careful about accidentally consuming flavored peanuts. If you are a strict vegan who avoids honey, you don't want to inadvertently eat honey-roasted peanuts or other flavored peanuts that may contain gelatin. Stick to dry-roasted peanuts, which are vegetarian- and vegan-friendly. Peanut butter is another vegetarian favorite that can be incorporated into a number of healthy dishes, eaten plain, or added to a fruit smoothie when you are looking for a protein pick-me-up. The plant-based protein featured in peanuts is especially attractive to vegans and vegetarians; however, you can have too much of a good thing. Despite all of their health benefits, peanuts should always be eaten in moderation. Consuming large quantities of the popular legume provides hefty doses of saturated fat, sodium, and calories and can cause stomach pain or diarrhea. Now that you've learned the answer to "Is a peanut a legume?" you will likely be more apt to crack open a shell or two the next time you're hungry. Fortunately, peanuts are relatively inexpensive, especially if you buy them in bulk. Before you purchase a 10-pound sack of peanuts, though, it's a good idea to inspect a few for quality. The legume's shells should be free of cracks, dark spots, and holes, and the shells should not make a rattling noise. The sound suggests that the peanuts have dried out and their taste has been compromised.